My BFF Lauren came over to help me with this project. Because I was certain it would turn out to be a project. My goal was to make empanadas from scratch to share with my book club on the evening we discussed Daughter of Fortune by Isabel Allende. These Chilean empanadas — along with delicious alfajores — seemed to fit the theme of the book perfectly. 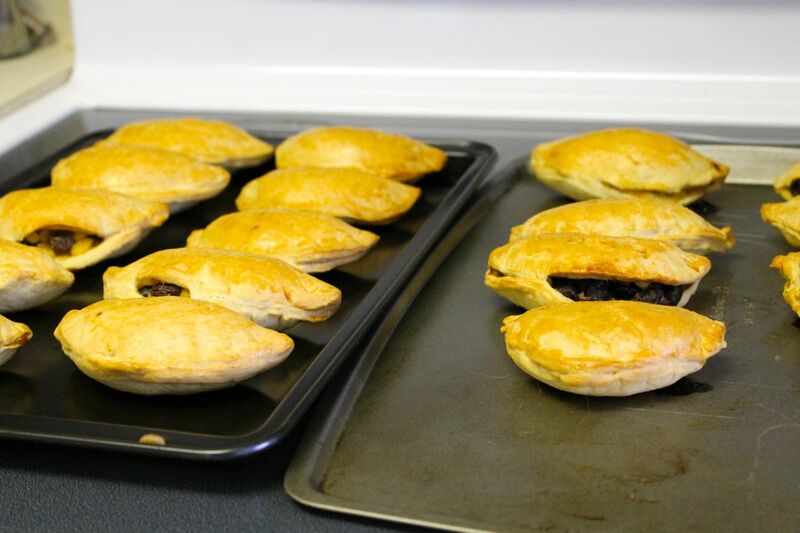 I put a few different recipes together to come up with scratch-made dough, a beef-based filling, and a black bean filling. The beef version is the traditional Chilean version, but I also wanted a vegetarian option. Pretty easy concept here, just a lot of work. Mix up the fillings and set them aside. Make up the dough and roll it out, then cut circles. 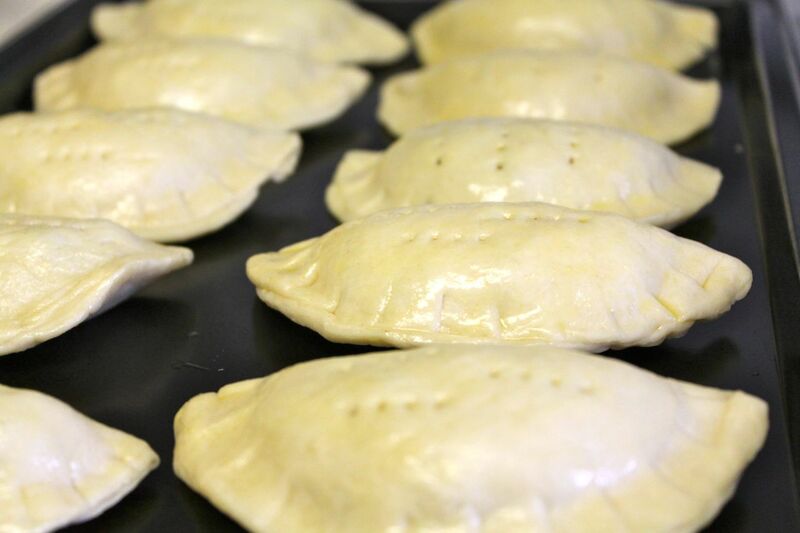 Seal up the empanadas. We used a ravioli kit, and it worked really well. Place them on the baking tray and coat with an egg wash. Overall, I thought these were decent, but not necessarily my fave. The dough is a little thick and hard. I would have preferred a softer dough, more like biscuit or pie dough — I should maybe have used shortening or the traditional option: lard. As for the fillings, the beef is too onion-y — though from what I’ve read, that’s probably more a Chilean thing than the fault of this recipe. And I can’t really put my finger on it, but the bean filling was a little weird. I left out cheese from the fillings, thinking it would be better to offer dairy-free options to guests. But I served them with some queso, salsa, and guacamole, so that worked out well in the end. 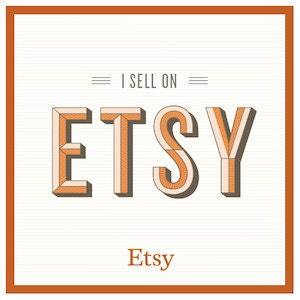 So I’m aware I’m not really selling this too well. You should try this though! I do think that my opinion of this is mostly just an issue of personal preference. The recipes themselves aren’t bad. I froze the leftovers. Thawing one or two at a time to have with a bowl of soup made for a great lunch. Here’s the thing — I can’t find the recipe I used. But maybe that’s not the end of the world, considering I didn’t like it all that much. I’d recommend Martha Stewart’s empanada dough recipe, just because I usually have good luck with her stuff, or do what one site suggested and just use refrigerated biscuit dough. If you make you own dough, divide it into two sections and refrigerate it so it’s not too soft for rolling. Heat the oil in a pan over medium heat. Add onion and cook 2-3 minutes until onion is translucent. Add meat and blend together. Add salt, pepper, and spices, and continue mixing over heat until meat is browned. Remove from heat and let cool. Heat the oil in a pan over medium heat. Add the chopped onions, cumin, and garlic salt, and sauté until the onions are soft and translucent, about 5-8 minutes. Add the chopped tomatoes, black beans, and sugar. Saute, stirring, for about 5 minutes more, or until excess liquid has cooked away and tomatoes are beginning to stick to the pan. 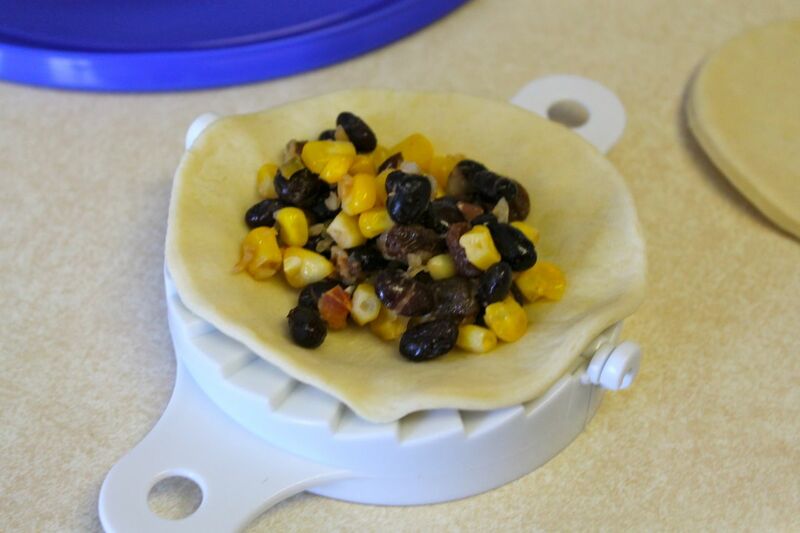 Add the corn, raisins, and lime juice, and cook for five minutes more. Remove mixture from heat and scrape into a heat proof bowl. Let cool to room temperature, then chill for at least one hour. 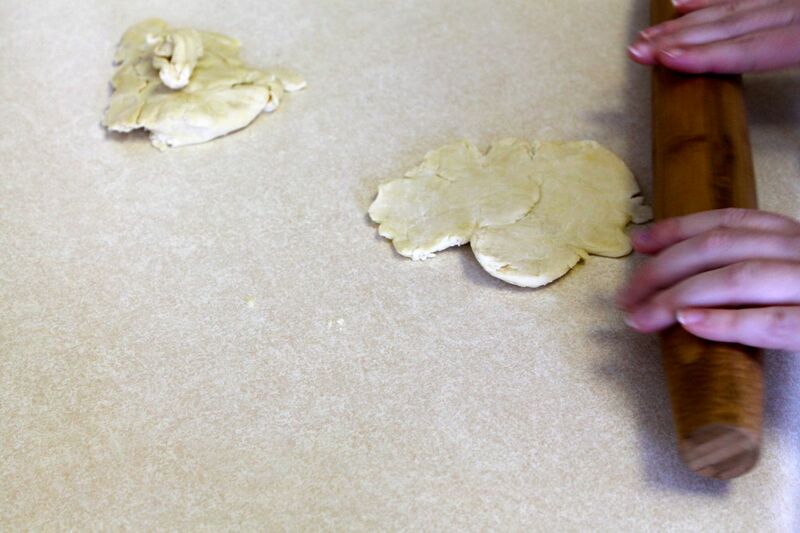 Roll your dough out to about 1/4″ thickness. Cut into circles. Fill your circles with a spoonful or two of the filling. 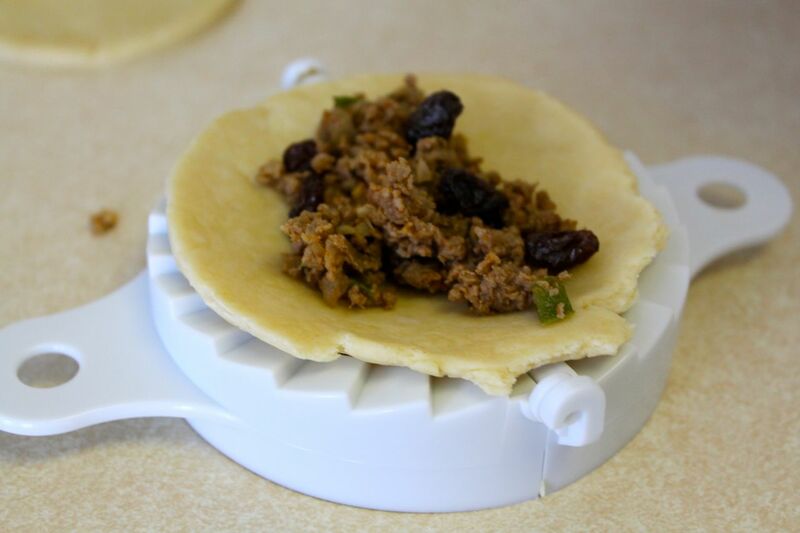 If desired, add a few raisins and/or olive slices on top of the filling. Fold in half and press the edges shut. If necessary, wet your finger and run it along the sides to seal the edges shut. Scramble the egg in a bowl. 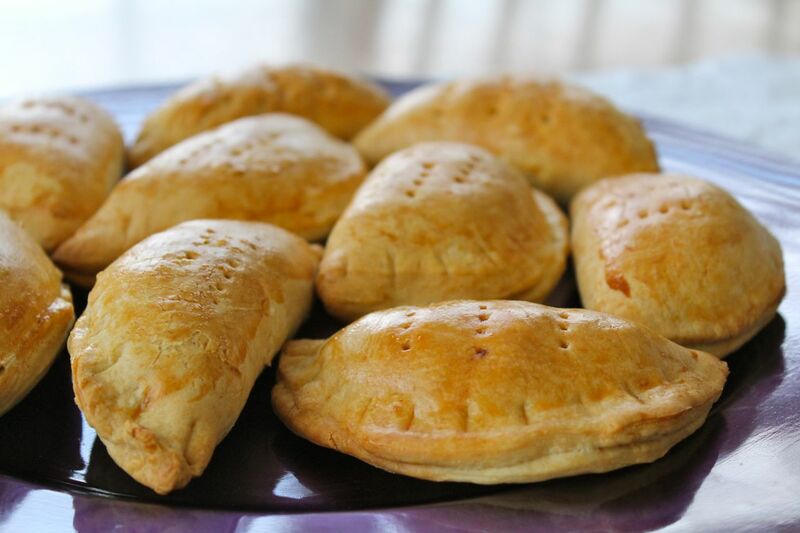 Brush a light egg wash coating on each empanada. 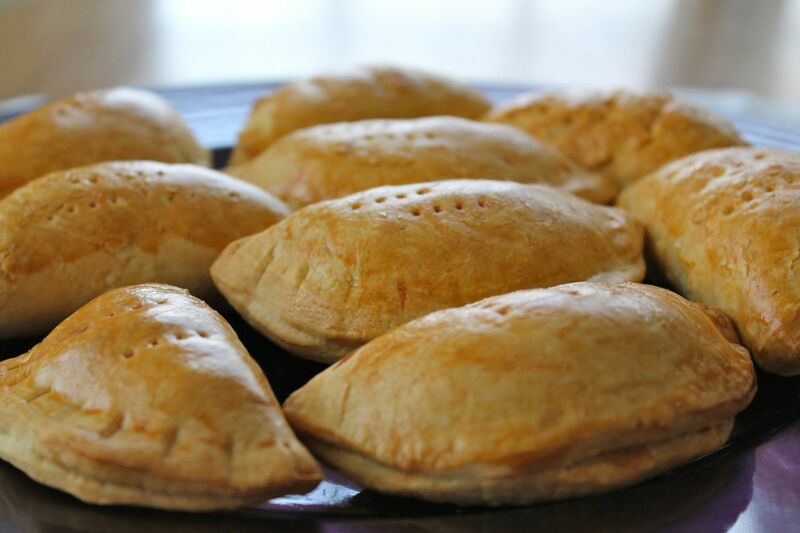 Bake for 20-30 minutes or until empanadas are a golden brown color. This looks so good! I can’t wait to try it out. I just wouldn’t use that egg coating at the end. Can’t stand eggs, lol! I also don’t like eggs… The egg wash doesn’t give it any taste, it just gives it a shiny coating. But if you really don’t like eggs, it’s certainly not necessary at all. 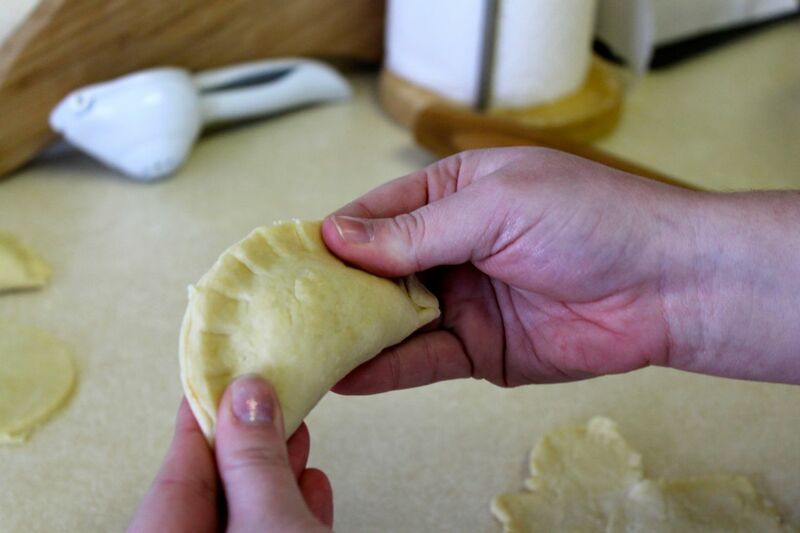 If you try it, let me know how your empanadas turn out! Thanks for visiting!